The cutlery in this tableware set, designed by RFSU Rehab for Ergonomi Design Gruppen, is comprised of black plastic handles and stainless steel implements. The significance of design for the human condition cannot be understated and this tableware demonstrates the value of looking beyond aesthetics, to consider tools as objects that can enable greater independence in the user. Still an essential tool for eating, flatware is also a decorative item, with a great deal of importance given to the ornamentation of the pieces, making a selection of these implements highly personal. Flatware designs are also centered on how the utensil feels in the hand; that is, is the piece properly weighted and balanced. Designing flatware becomes a more complicated task when designers are challenged to create flatware that is both ergonomically sound and aesthetically pleasing. Ergonomics, the study of the movements of work, is concerned with the interactions between humans and their environment, specifically, how people best perform utilizing the tools and elements at their disposal. Ergonomics as a field of study emerged in the 1940s, tying its evolution to the combat injuries resulting from a world at war. Development of ergonomic tools grew with the understanding that the human body essentially functions like a machine, and whether in the workplace or at the dining room table, people need accurately adjusted tools to function optimally. Sweden has long been at the forefront of design for individuals with varying needs and abilities. Ergonomi Design Gruppen is a firm that became involved in designing for the working environment. 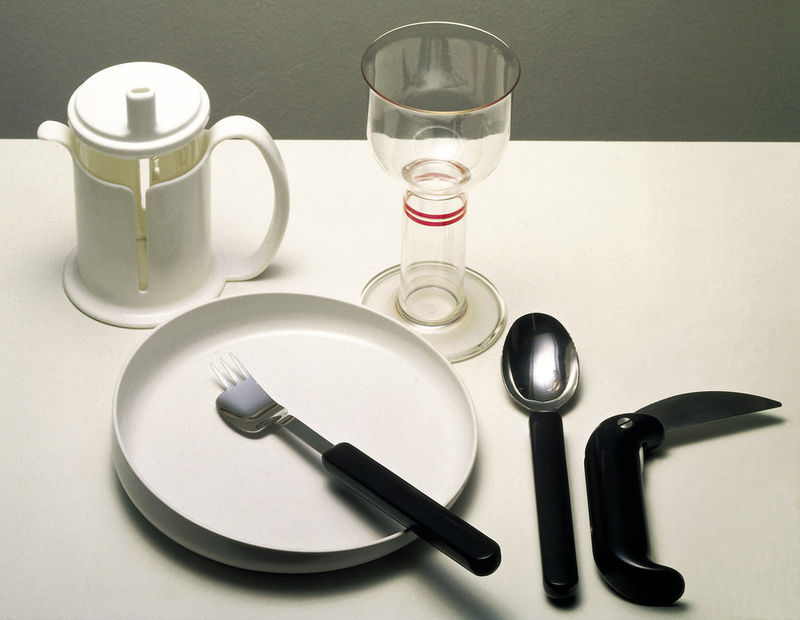 In the 1970s, Ergonomi Design Gruppen was hired by RFSU to design tableware as part of an “eating and drinking” program which focused on utensils for single-handed people. This table grouping is a result of that design process. The flatware handles are designed with wider circumferences than usual, making them easier to grip. Some pieces are multi-functional, including a fork that combines tines with the bowl of a spoon and the serrated edge of a knife. The benefit of this tool is that the user does not have to keep changing implements to manage the food on the plate. The wider, heavier grip of the knife allows for greater exertion and the overall shape and pivoted head allows the blade to accommodate various users’ strengths and abilities. A wide stem on the goblet not only provides an easier grip, but makes the form more stable, while design elements of the cup, like a larger handle and a lid with a drinking spout, prevent spillage. Lastly, the rim of the plate, angled to be low on one side and high on the other, centers food and prevents it from being pushed off the plate. Eating is not only an essential activity, it is a social one as well. Tableware for people with different abilities not only enables them to remain involved with the world around them, but provides a sense of independence often lost with the loss of movement. This tableware reminds us that good design is important to even the smallest aspects of life. Susan Teichman is a design historian who specializes jewelry history and the architectural history of synagogues.